Meeting tight project deadlines and remaining on budget with custom high performance entrance systems can be difficult to coordinate, as high-grade commercial doors with short lead times are not easily obtainable. CRL-U.S. Aluminum has solved this issue with its line of Balanced Doors, which can be crafted and delivered in less than 30 days and competitively priced compared to traditional swing doors. These performance-driven systems are not bound by common availability delays or premium costs that often hinder the architectural community’s confidence in specifying balanced doors. 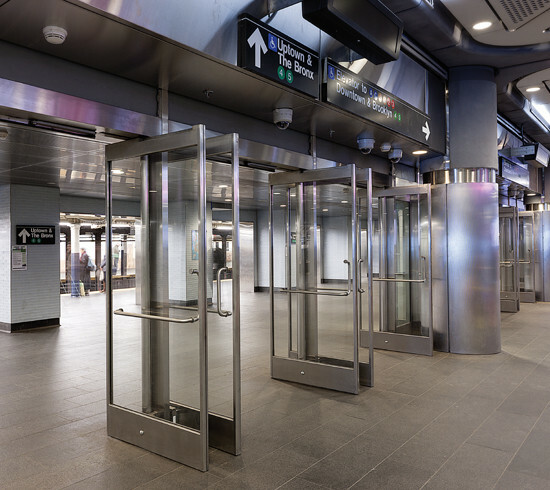 Whether it’s Chicago’s high wind pressures or the nearly 300,000 daily riders at New York City’s redesigned Fulton Center, CRL-U.S. Aluminum Balanced Doors are precision-engineered and tested to withstand maximal wind and traffic applications while effortlessly accommodating A.D.A. accessibility needs. CRL-U.S. Aluminum’s advanced manufacturing capabilities and innovative engineering approaches have allowed architects to design confidentially without compromising aesthetic vision in the interest of budget or lead time – an assurance no other manufacturer can offer.